Winchester Hills Div 01 Bldg. Cottage Lake Beach Club Bldg. COTTAGE BROOK DIV A Bldg. A city of just more than 10,000 people at the north edge of the Eastside, Woodinville is a town with a suburban feel despite being close to many larger cities. The area is marked by beautiful evergreen trees and the Sammamish River which cuts through town. It is an upscale city with a high per capita income, although most of the residents commute to other Eastside locations such as Bellevue and Redmond. One only needs to take a quick look at the MLS listings in Woodinville to see how popular this area is with home buyers. The median cost of a single family home comes in at well above half a million dollars. There are plenty of large homes, condos & townhomes for sale within the city, as this is a popular place for families to settle. People looking for a quiet setting that is still within a short drive to work often end up considering Woodenville as an ideal choice. The waterfront parks along the Sammamish River are among the most popular activities in Woodinville – along with visiting the many wineries in the area. The Chateau Ste. Michelle winery is the most well-known, but there are several others, in addition to breweries. DeYoung Park, which is located right in the heart of the city, hosts a series of concerts in the summer months for residents to enjoy. Because of its location, those who decide to call Woodinville home tend to value their time outdoors and all of the opportunities that the Pacific Northwest makes possible. Stevens Pass Ski Resort is a relatively short drive to the northeast from Woodinville, and the touristy Leavenworth is not far beyond the pass. However, despite proximity to the mountains, Woodinville is still only a half hour drive from downtown Seattle in good traffic conditions. So, if you're looking for a Woodinville homes for sale this town has a blend of urban and rural, it is obvious what makes Woodinville so attractive – and keeps real estate prices near the upper end of the market. 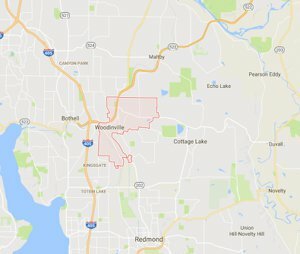 Since it is a city of just 10,000 people, those wanting to buy a house in Woodinville will need to carefully watch the MLS listings for homes for sale until the right property become available.